This painting is finished, it is in the galleries under the Love’s Call cover art page. This was a prebooked commission and is the second commission in a series of books by C. A. Szarek. The first one was ‘Sword’s Call’ (Click on the image below to see the full painting). I took some notes & a lot of screenshots while painting this piece, so be prepared for rambles and rough drawings! So once the client picked the thumbnail she liked best, I started drawing up a finalised sketch. By final, I mean enough details so that the image is clear and there can be no mistakes on how the final painting should turn out. I’m not going to draw every single leaf, and some things like the columns I need to work out how I want to paint them, but the costumes, poses, locations of important items are all there. I draw bits on different layers so I can move them around (like the background and the characters are on a different layer. The wolf and the people are separate. As an artist, there were a few minor things that I would have done differently. Originally the characters were smaller, I think the wolf was looking towards a point that would compositionally bring the eye back up towards the top of the painting, but with commission work you are painting for someone else. As long as the client is happy, that’s what primarily matters. After the sketch was sorted, I moved onto colour concepts. The great thing about digital paintings is you can copy and paste to your heart’s content. I ended up sending 4 concepts. 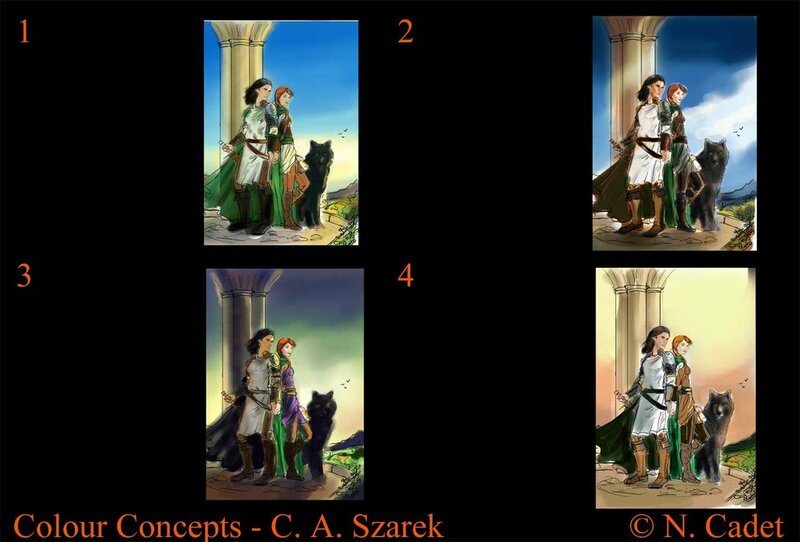 The author had specified the characters’ colouring, and the woman’s cloak had to be green. Green was actually the keyword for this cover. The previous cover had been pinks, this one needed to be green, but to try and keep it from being too green you need pops of colour. Plus the woman is actually the one we want to be focusing on, so I tried to play down the colours for the man, even though he’s actually in front of her. Ebook view - I added a ebook version just to make sure it worked. This was the final colour concept. Still a lot of work before it becomes a final painting, but that will be for next time!